Here are some 78 RPM record label pictures for your enjoyment - only for non-commercial use on phonographs in homes and for no other purpose. Lastivka on May 19, 2014. 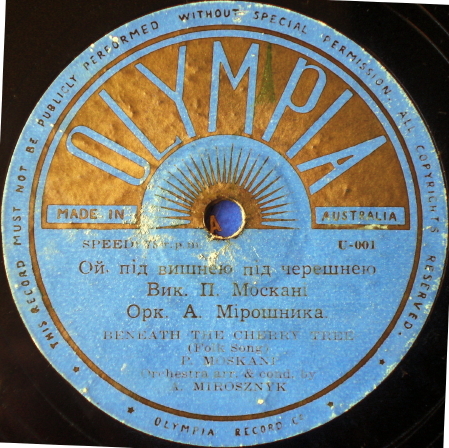 The Olympia label was founded in Australia in 1951 by Ukrainian-Australian composer and virtuoso pianist Anatolij Mirosznyk. After a few records, he issued under the "Cosmopolitan" label. The Olympia records were reissued under the Cosmopolitan label as well, with the same Matrix numbers. Your Name: Will be publicly displayed (REQUIRED). Your E-Mail: Not publicly displayed. For our records only (REQUIRED).